For those of you who are uninitiated to the pleasures of sporting excellence on two wheels and steroid allegations, today the Tour de France starts in Liège with the Prologue. I will be posting updates throughout the day. 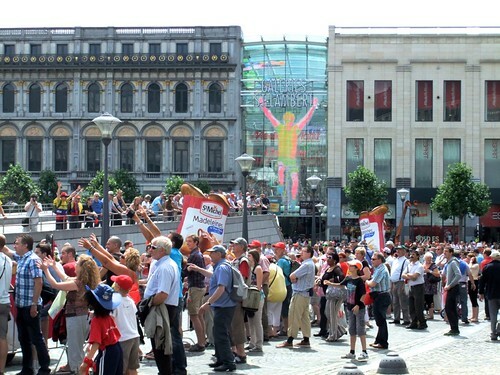 Thousands of people are gathered around the Place Saint Lambert and the rest of the circuit. This is apparently the biggest post-it drawing in the world! 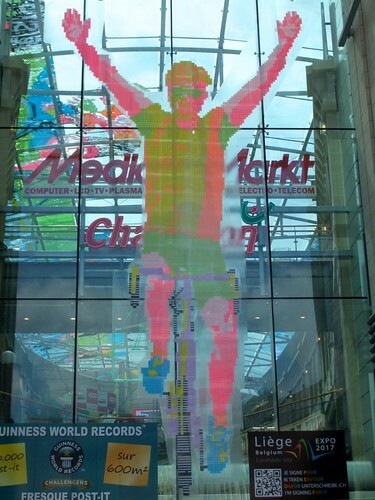 On the facade of the Galeries Saint Lambert. I work in the "Galeries Saint-Lambert" management offices in Liège.Your photographs of the "Tour de France" held our attention. Do you think that it would be possible to send them to us in high-resolution for a completely private use and intern to our management? Thank you in advance for your return.